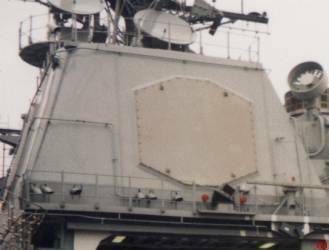 The Aegis weapons system is a surface-to-air integrated weapons system. It is designed to defend the fleet against any airborne threat. 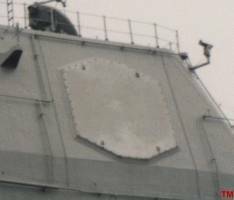 The heart of the Aegis system is the AN/SPY-1 Phased-array radar system coupled with the AN/UYK-1 high-speed computer system. This combination is able to detect incoming missiles or aircraft, sort them by assigning a threat value, assign on-board Standard surface-to-air missiles, and guide the missiles to their targets. Aegis can track up to 100 targets at any given time. 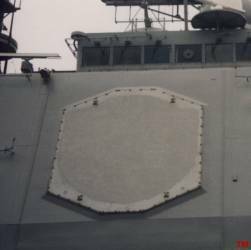 The radar panels are flat structures, mounted to give 360 degree coverage around the ship. These are an improvement over the old rotating type of radar in that there are no moving parts. The old rotating radar covered ONLY the area they were scanning. Phased arrays switch rapidly and cover the entire range around the ship in milliseconds. Phase III integrated JTIDS and the OJ-663 color display Tactical Graphics Capability into the AEGIS Combat System. Baseline 6 will be developed in two phases. Baseline 6 Phase I is planned for the last ship in FY 1994, and Phase III is planned for the first ship in FY 1997. Baseline 6 Phase III is the designation for the computer suite resulting from consolidation of the previous Phase II baseline with variations designed to introduce Tactical Ballistic Missile Defense (TBMD) and Cooperative Engagement Capability (CEC) in in-service ships. Baseline 6 upgrades will include embarked helicopters, Fiber Optics as applied to Data Multiplexing System (DMS), implementation of affordability initiatives, the Radar Set Controller Environmental Simulator (RSCES) and Battle Force Tactical Trainer (BFTT), Advanced Display System, Evolved SEA SPARROW Missile (ESSM), Identification (ID) upgrades Phase I, Advanced TOMAHAWK Weapon Control System (ATWCS) Phase II, Fire Control System upgrades, and the Joint Maritime Command Information System (JMCIS). The US Navy's defense against this threat has continued to rely on the winning strategy of defense in depth. Guns were replaced in the late fifties by the first generation of guided missiles in their ships and aircraft. By the late sixties, these missiles continued to perform well, but it was recognized that reaction time, firepower, and operational availability in all environments did not match the threat. To counter this, an operational requirement for an Advanced Surface Missile System (ASMS) was promulgated and a comprehensive engineering development program was initiated to meet that requirement. ASMS was re-named AEGIS (after the mythological shield of Zeus) in December 1969. The Aegis system was designed as a total weapon system, from detection to kill. 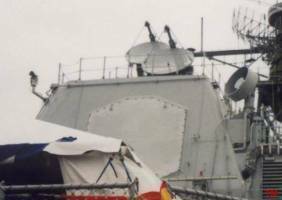 The heart of the AEGIS systems is an advanced, automatic detect and track, multi-functional phased-array radar, the AN/SPY-1. This high-powered (four megawatt) radar is able to perform search, track and missile guidance functions simultaneously with a capability of over 100 targets. The first Engineering Development Model (EDM-1) was installed in the test ship, USS NORTON SOUND (AVM 1) in 1973. AEGIS is currently carried aboard 2 types of ships. The TICONDEROGA-class cruisers were the first. These ships are often fitted with 2 MK 41 VLS. They can carry up to 122 missiles of all types, including Tomahawk, Standard and SLAM. These ships carry a "full" AEGIS System. The second type of ship is the ARLEIGH BURKE-class destroyer. The AEGIS System carried aboard these ships is slightly less capable than the full AEGIS. These ships carry the same complement of missiles as the cruisers.